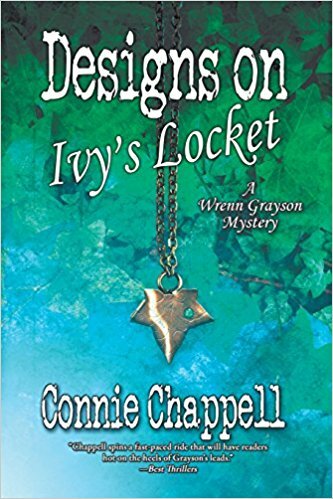 The Bottom Line: You’ll adore this spectacular sophomore mystery from Connie Chappell. Chappell’s debut novel introduced readers to historian Wrenn Grayson. Designs on Ivy’s Locket brings them back into the world of small-town Ohio and its unique combination of local charm and unexpected intrigue. Blending history and modern-day sleuthing, Grayson’s second case takes her back to the 40s. As you might have guessed by the title, the recovery of a precious jewel is at the heart of this novel, but there’s more to the case than a simple bauble. After meeting with socialite Kerry St. John, Grayson sets out to discover exactly who stole the locket. It belonged to St. John’s grandfather, Dexter, and through the pages of his tattered, travel-worn journal, Grayson uncovers three suspects and a layered, deep family story that twists together death, burglary, and loyalty. Chappell’s deft use of Dexter’s journal lets readers jump from the past to the present and allows for a charming cast of characters in both. It’s clear that Chappell’s done her homework. The flashbacks are vivid, making for delightful respites from the main case. As Grayson gets closer to the whereabouts of the locket, the sleepy town reveals itself to be more than an idyllic enclave, and history seems to have a way of sneaking into the present day. Chappell spins a fast-paced ride that will have readers hot on the heels of Grayson’s leads. Though the historian’s extensive knowledge has her barreling towards the answers, it’s the seemingly dead ends and the detective-for-hire’s one-of-a-kind process that’ll have fans flipping the page.